Tinyard Enterprise Co.,Limited is one of the top level China 80pcs wet tissue packing machine manufacturers and suppliers, welcome to wholesale 80pcs wet tissue packing machine from our factory. 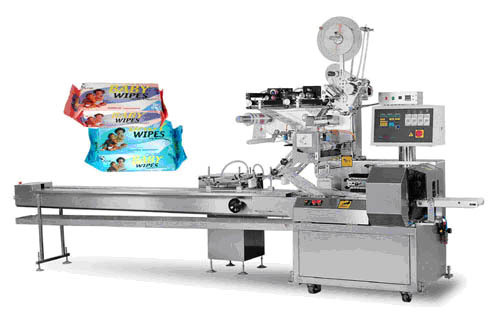 This machine is the new folding and cutting machine for 5-100 pieces/sachet big package or continuous extracting wet wipes. 1. Non-woven clothcutting→longitudinal N shape folding→crossing buckle each other in N shape→spraying liquids→cutting→pile up materials→ products →connect with packing machine. 2. Materials onto the machine→cutting→folding→cutting→pile up materials→ products →connect with packing machine. 1. Use the Mitsubishi frequency changer, the PLC control system, entire automatically electric eye, touch screen. 2.Automatically fold in N、V、Z shape and cut. 4. Automatically count number system. 5. Stainless steel stirring saving pot. 6. Automatically original paper (cloth) cutting system (2). Folding type: shape fold and buckle each other, continuous extracting type. Cut off in V、Z、N shape. 2. Digital show the length of packages and adjust automatically. The PID intelligence automatically warming controlling system. 3. Automatically tear up the hole and print label system. 4. Package angle folding system. Packing materials: OPP、CPP、PET and so on.